Imagine a 650-unit, $250 million Disney Vacation Club (DVC) timeshare resort on a Newport Coast hillside overlooking the Pacific Ocean, just a half hour from Disneyland. Now imagine that Disney magic has made the resort into an Italian Mediterranean village, complete with Venetian canals and a Roman aqueduct. The only way youll ever experience a Newport Coast DVC resort is in your imagination. For a while, it seemed the resort would become a reality. It wasnt just a rumor. In March 1994, Disney officially announced the Newport Coast DVC project. Italian Mediterranean architecture of Marriottsnot DisneysNewport Coast Villas. Following the success of the original Disney Vacation Club (now named Disneys Old Key West Resort) at Walt Disney World, Disney was positioning itself to be a major player in the timeshare business. Prior to announcing the Newport Coast DVC project, Disney announced plans for Vero Beach, Florida, and Hilton Head, South Carolina. Reports said Disney had acquired land at Beaver Creek in Colorado. And the August 1995 issue of Wired magazine featured an article about Times Square in New York City. According to the article, A key corporate player is the Walt Disney Company, future tenant of a 47-story hotel being developed by Dream Team Associates. The accompanying artwork showed a tower prominently displaying the Disney Vacation Club logo. And who knows what other unannounced DVC projects were in the works at the time? The villas climb up a hillside; some villas have better views than others. In October 1995around the same time that the Vero Beach DVC resort openedDisney announced a revised Newport Coast plan that would include a free-standing hotel and larger restaurants. According to an Orange County Register article at the time, The revisions may delay the construction until 1997, when Disney originally hoped to have the project open. In Spring 1996, the Hilton Head DVC opened. Officially, the Newport Coast project was still alive. But despite previous announcements, construction at Newport Coast didnt start in 1997. Instead, in February 1997, Disney announced that they were canceling the plans and putting the land on the market. Marriotts Newport Coast Villas reflect California style. The dining area has a table for six, with room for two more at the counter. Then, in January 1998, Marriott announced plans for its first California coast Vacation Ownership resort located on the rolling hills overlooking the Pacific Ocean between Newport Beach and Laguna Beach. The site, it turned out, was the former Disney site. In June 2000, Marriotts Newport Coast Villas opened its first 55 units, with plans for 650. 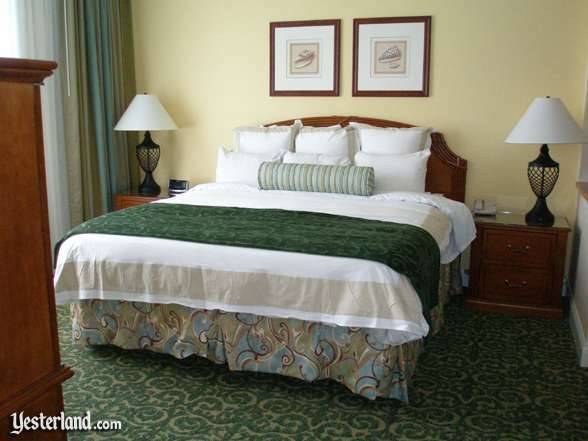 The bedrooms provide Marriotts comfortable Revive bedding. So why did Disney pull the plug on Newport Coast Villas? Did disappointing sales at Vero Beach and Hilton Head influence the decision? How about the debt that Disney took on for the purchase of ABC in early 1996? What about the April 1995 arrival (from Marriott) and February 1996 departure (to become CEO of Hilton) of former Disney CFO Stephen Bollenbach who had extensive insight into the timeshare business? Was the Newport Coast decision related to Disneys 1996 decision to scale back the Disneyland Resort expansion planwhen the plan for the relatively modest Disneys California Adventure park and a single new hotel replaced a much more grandiose previous plan for WESTCOT Center and several new hotels? The answer is probably complex, and those of us on the outside can only guess. The Marriott swimming pools have a million dollar view. I highly recommend Marriotts Newport Coast Villas. 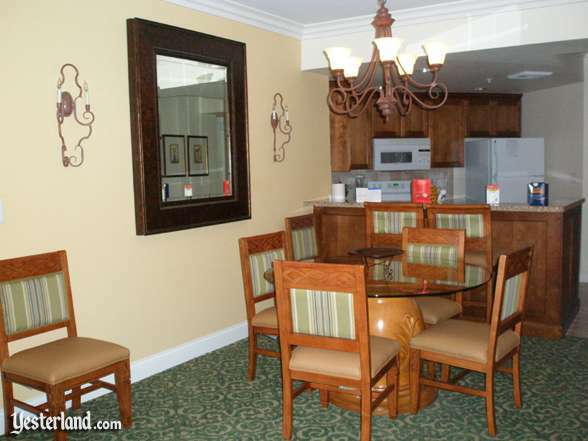 The accommodations and public areas at Newport Coast Villas are wonderful. Although Marriott scrapped Disneys designs and drew up their own, the resort is still themed as an Italian Village. The hillside location is one of the most valuable pieces of residential real estate in the country. 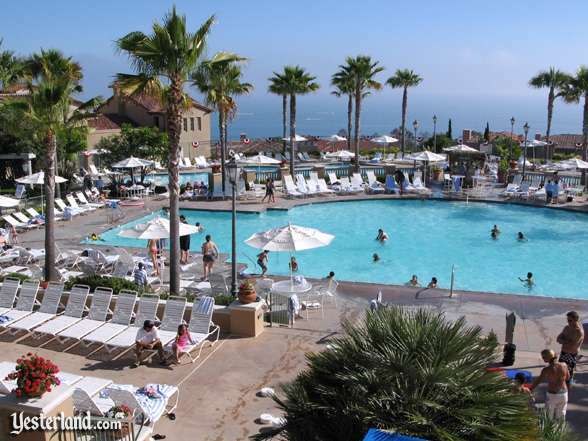 Theres nothing between the Marriott property and the ocean except for a country club, the Coast Highway, and Crystal Cove Beach State Park. All units have two bedrooms, two bathrooms, a jumbo shower with two shower heads and a large soaking tub in the master bath, a balcony with table and chairs, a full kitchen, a stacking washer and dryer, and a pull-out sofa in the living room. The Disneyland parking lot is only about a half hour drive awaybut it can take another half hour to get from the parking structure to Disneylands Main Street USA. Theres no shortage of things to do around Newport Coast. Newport Beach is a great place for shopping and dining. You can walk all the way around Balboa Island in Newport Bay, enjoying views of the yacht harbor. Nearby Laguna Beach is famous for its artists, art galleries, and art festivals. Anyone staying at Newport Coast Villas should, if at all possible, fly into Orange County Airport (SNA), not Los Angeles International (LAX). The drive from LAX is a pain. SNA is just 15 minutes away. Marriotts Newport Coast Villas resort trades through Interval International (II). Its a tough trade for summer weeks. Because DVC switched from II to rival exchange company RCI at the beginning of 2009, DVC members can no longer obtain DVC World Passport Collection exchanges into Newport Coast Villas. 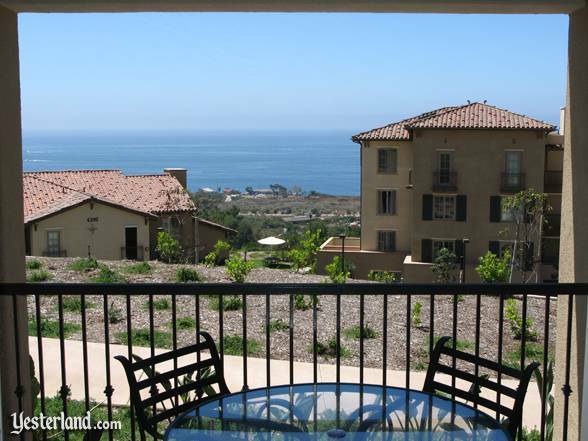 Unlike many coastal timeshare resorts which have designated view categories for ocean views and other views, there are no such categories at Newport Coast Villas. In theory, all units have excellent views. 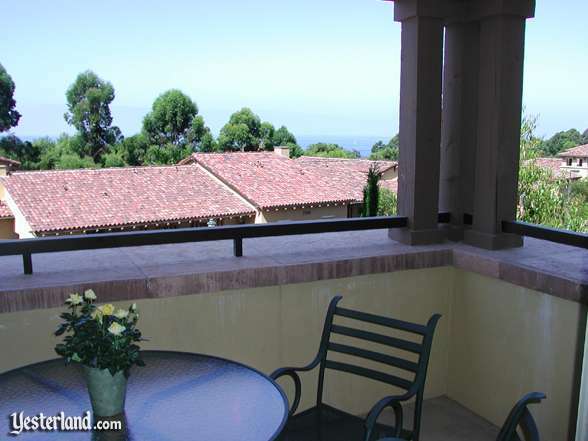 But, in fact, the views range from spectacular 180° ocean views to views of buildings and parked cars. The best view locations go to multiple week owners staying multiple weekssome stay the whole summer. Exchange guests should expect a great condo (all condos are essentially the same), but not necessarily a great view. The three photos below are examples of ocean views. Some balconies have no view of the ocean. Some, like this one, have an obstructed view. Some balconies have a spectacular view. Some balconies have an even more spectacular view. 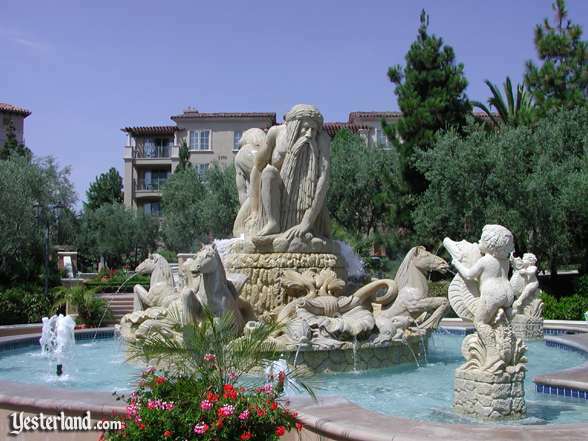 Photograph of Marriotts Newport Coast Villas fountain: 2006 by Werner Weiss. Photograph of Marriotts Newport Coast Villas park and building: 2007 by Werner Weiss. 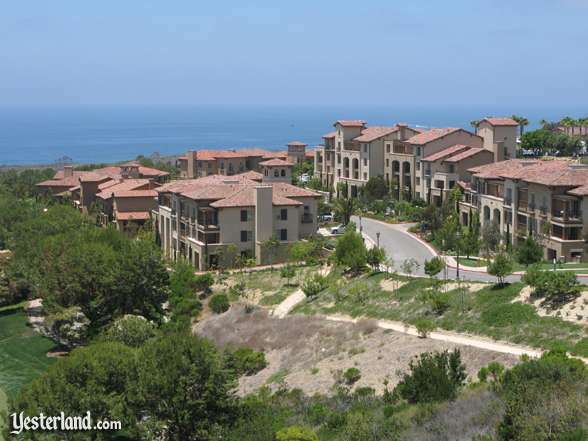 Photograph of Marriotts Newport Coast Villas buildings on hillside: 2007 by Werner Weiss. 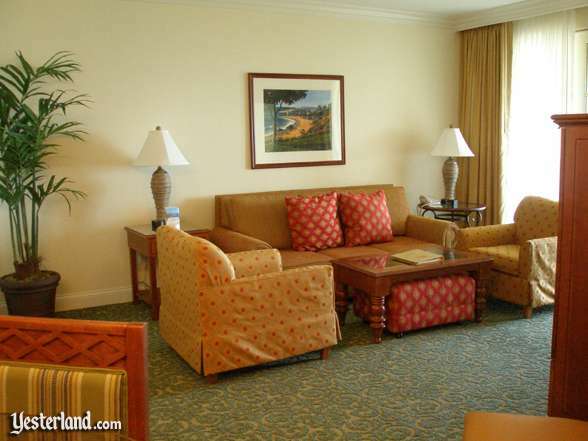 Photograph of Marriotts Newport Coast Villas living room: 2007 by Karen Weiss. Photograph of Marriotts Newport Coast Villas dining area: 2007 by Karen Weiss. 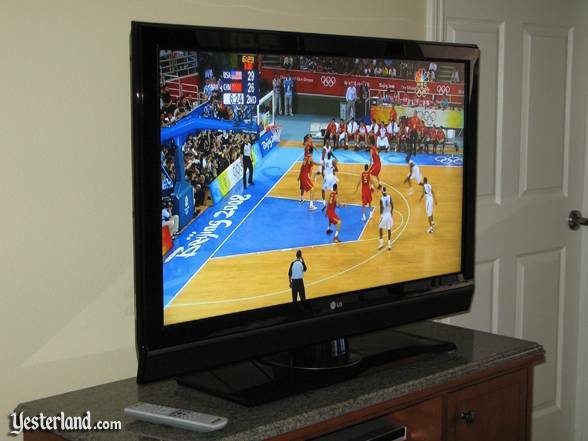 Photograph of Marriotts Newport Coast Villas HD television: 2008 by Werner Weiss. Photograph of Marriotts Newport Coast Villas master bedroom: 2007 by Karen Weiss. Photograph of Marriotts Newport Coast Villas main pool: 2007 by Werner Weiss. 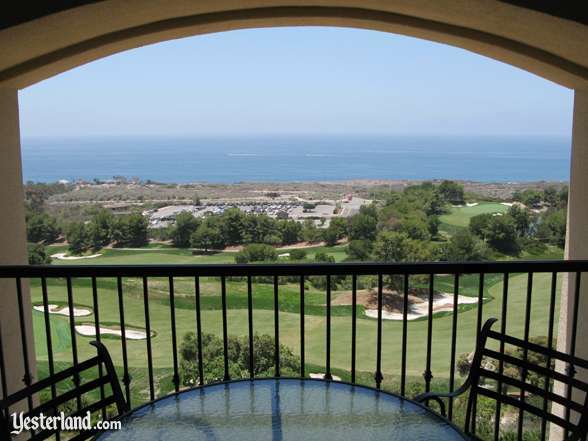 Photograph of Marriotts Newport Coast Villas obstructed ocean view: 2006 by Werner Weiss. Photograph of Marriotts Newport Coast Villas ocean view with buildings: 2008 by Werner Weiss. 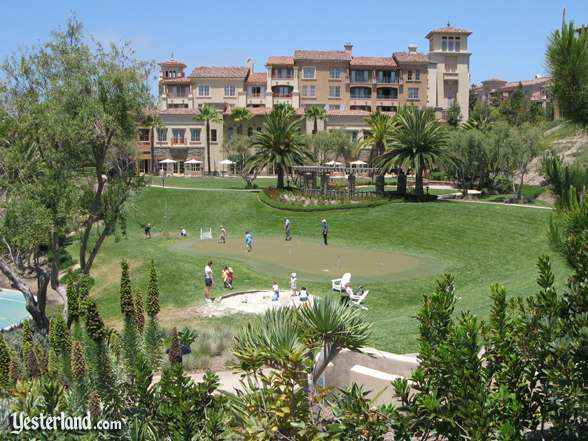 Photograph of Marriotts Newport Coast Villas ocean view with golf course: 2007 by Werner Weiss.